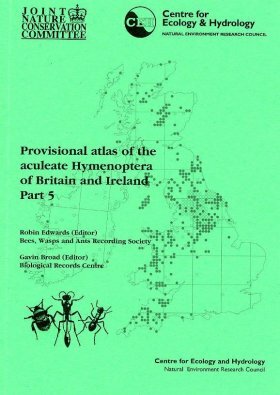 The work of mapping the distribution of aculeate Hymenoptera, plus describing their life histories, is the major activity that BWARS undertakes. To complete species profiles, BWARS runs provisional maps and profiles in its newsletters. This is accompanied by a call for records to supplement any already held by the society. The account and map is revised according to any new data that is received. This is then published in an atlas, which contains fifty-sixty species accounts. On this website, each species account originally displayed a distribution map. These maps were generated by the National Biodiversity Network Gateway mapping service and contained only records validated by BWARS. With the launch of the NBN's Living Atlas and the closure of the NBN Gateway maps, currently it is not possible to display maps from NBN data. We hope this will soon be resolved and maps restored to the species accounts. Please be patient - we have around 900,000 records to upload, so the wait will be worth it! In a few cases you may see a map that contains no records, even though the species account describes a distribution for that species! This usually happens for species where there is confusion over the precise identity of the species, e.g., Andrena rosae Panzer. Data was most recently uploaded onto NBN Gateway on 23 February 2012. Purpose of data capture: The dataset has been created to identify the UK distributions of species of bees, aculeate wasps and ants. However some of the individual records may have been taken as part of site based environmental impact assessments, university-based projects, Species Recovery Programme work or general survey work. Methods of data capture: Standard field methods were used. Data has also been captured from the literature and from specimen data labels in museums. Conversion to electronic format has been done by a number of data suppliers from within BWARS and with assistance from BRC. Historic data is included wherever possible. There has been a further increase in the supply of digital information to the Society since the previous upload of data in 2009. Geographical Coverage: The Society gathers data on the Aculeate Hymenoptera Fauna of Great Britain and The Channel Isles. BWARS data relating to the island of Ireland is shared with the National Biodiversity Data Centre (Ireland). Data Quality: Data is validated via an electronic data validator (developed by BWARS) and by experienced senior members of the Society. Data should always be checked against original sources before use in contentious circumstances.